From melancholy to joyfulness and back. From melodic depths to rhythmic curiosities. A collective effort resulting in engaging selection of music tracks. 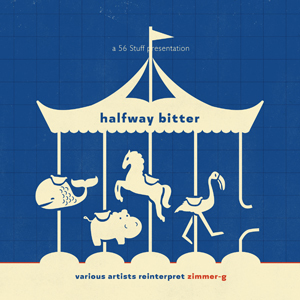 That’s what happened: various artists took a new look at tracks from Halfway Sweeter album by Zimmer-G. One might think that this is just yet another remix compilation nobody needs. Well, we have a response to this: our approach is to show that remixes can be interesting, elaborate and inventive. We are not interested in club-oriented dance versions. We want you to enjoy the results of thoughtful artistic reinterpretation. It is always interesting to see how various creative minds work differently with the same material. Some of them concentrate on elements of rhythm, some prefer to deal with melodies, some deconstruct the whole composition on the level of sound and then gather something completely new from it. And the result is always unpredictable! That’s what we love the best. And our belief is that you love this as well. Spotify, iTunes, Google Play, Amazon, and Juno.